Zoro presented a personal 3 hour intensive study on R&B drumming concepts, concentrating on New Orleans 2nd Line and Funk grooves (monster grooves & time feels, independence, playing to a click, groove chops, funky bass drum & hi hat techniques, finger control, and innovative groove concepts). This class took Z’s previous clinic to the next level. Sixteen lucky drummers were on hand to take in this Master of Groove. Zoro has sat on the drummer’s throne commanding some of the most famous stages in the world of rock and R&B music. He’s long been in the spotlight—stationed center stage behind some of the most celebrated artists in music history. Zoro has toured and recorded with Lenny Kravitz, Bobby Brown, Frankie Valli and The Four Seasons, The New Edition, Jody Watley, Philip Bailey of Earth, Wind & Fire, Vanessa Paradis, Sean Lennon, and Lisa Marie Presley—to name only a few. Over more than two decades of creating music, Z has displayed a gifting and a personal charisma too unique to remain in anyone’s shadow. He emerged from behind his drum kit early in his career to establish his own unique celebrity as an often awarded, world acclaimed musician and educator. Throughout his career, he has consistently been voted #1 R&B drummer and clinician in the world by premier music industry publications such as Modern Drummer, Drum!, and Rhythm magazines. 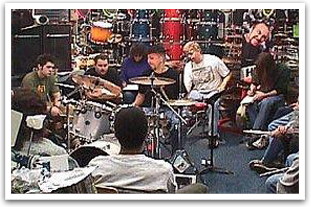 “Zoro wrote the book on dynamics, touch, control, and groove,” says Modern Drummer Magazine of Z’s musicianship, sensitivity and unique style. Often called the “Minister of Groove,” Zoro authored the #1 award winning and best-selling book and DVD package, The Commandments of R&B Drumming, which was awarded industry accolades as the ultimate lesson from the master.